As a London-based squirrel rescue, we get very full very quickly. So, if you ring us, we may advice you to contact another rescue group. Please be aware that, due to some misguided ideology concerning alien species, not all rescue centres are squirrel-friendly. The contacts below are, to the best of our knowledge, very good with squirrels. We would, unfortunately, advise against calling either the RSPCA or you local vet, unless you know them personally. 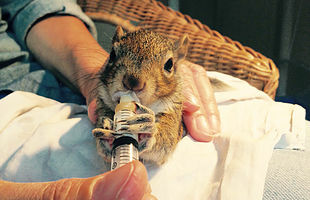 While the final decision lies with the individual vet or officer, the general licensing procedures make it very unlikely that they will help you, and they may insist on killing the baby squirrel you rescued. The rescue organisations listed below are licensed for keeping and releasing squirrels and should be able to help you – unless they are also full, of course.